Almin 10ml Suspension Each 5ml suspension contains Albendazola USP 200 mg.
Almin 400mg Tablet Each tablet contains Albendazole USP 400 mg.
Almin (Albendazole) is a benzimidazole anthelmintic, active against most nematodes and some cestodes. It is used in the treatment of intestinal nematode infections and in higher doses in the treatment of hydatid disease. Albendazole exhibits vermicidal, ovicidal and larvicidal activity.The principal mode of action of Albendazole is its inhibitory effect on tubulin polymerization, which results in loss of cytoplasmic microtubules. 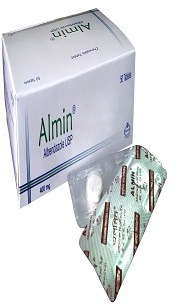 Almin (Albendazole), is used in the treatment of single or mixed intestinal infections caused by Enterobius vermicularis (Pinworm,Threadworm),Trichuris trichiura (whipworm), Ascaris lumbricoides (Roundworm), Ancylostoma duodenale & Necator americanus (Hookworm) Taenia solium & Taenia saginata ( Tapeworm), Strongyloides stercoralis.Albendazole is indicated in giardiasis in children over 2 years of age. Albendazole in higher dose is indicated for the treatment lf hydatid disease. 400 mg (one Almin 400 tablet or 10ml Almin suspension) as a single dose in cases of Anterobius vermicularis, Trichuris trichiurs, Ascaris lumbricoides, Ancylostoma duodenale and Necator americanus.In cases of strongyloidiasis or taeniasis, 400 mg (one Almin 400 tablet or 10 ml Almin suspension) as a single dose should be given for three consecutive days. Giasdiasis: 400mg (one Almin 400 tablet or 10 ml Almin suspension) once daily for five days. In the treatment of echinococcosis, Almin (Albendazole) is given by mouth with meals in a dose of 400 mg twice daily for 28 days for patients weighing over 60 kg. A dose of 15 mg/kg body weight daily in two divided doses (to a maximum total daily dose of 800 mg) is used for patients weighing less than 60kg. For cystic echinococcosis the 28 days course may be repeated after 14 days without treatment to a total of three treatment cycles. For alveolar echinococcosis, cycles of 28 days of treatment followed by 14 days without treatment may need to continue for treatment followed by 14 days without treatment may need to continue for months of year when three courses of therapy have been given. Side effects include epigastric pain, diarrhea, headache, nausea, vomiting, dizziness, constipation, pruritis and dry mouth. Albendazole should not be administered during pregnancy or in women through to be pregnant. Albendazole should only be used in the treatment of echinococcosis if there is constant medical supervision with regular monitoring of serum-transaminase concentrations and of leucocyte and platelate counts. Keep in cool and dry place, away from light.